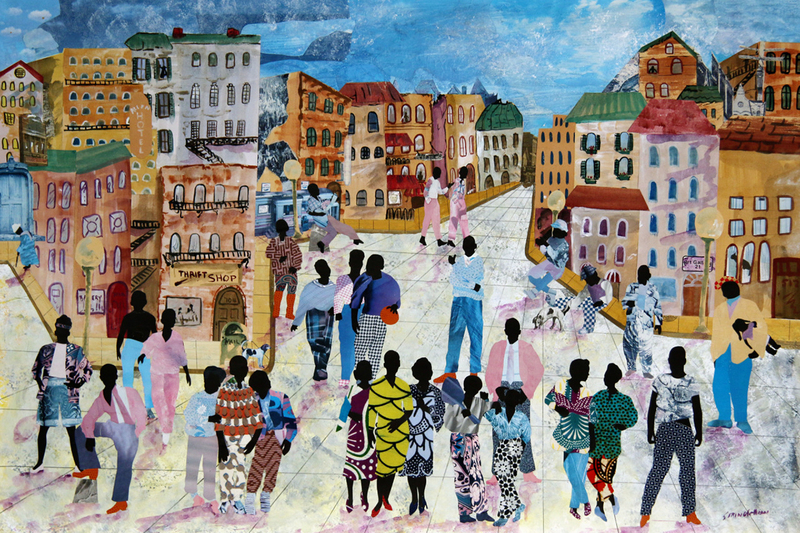 An exhibition at Krannert Art Museum featuring art from Chicago includes a collage and watercolor painting, “Street Smarts II,” by University of Illinois alumnus Allen Stringfellow. The museum’s fall exhibitions also highlight blue and white ceramics from its collection, including Chinese porcelain from the Ming Dynasty. CHAMPAIGN, Ill. — Two collections-based exhibitions at Krannert Art Museum show the depth and breadth of holdings of blue and white ceramics and of Chicago art at the University of Illinois. The objects on display tell a range of stories – from the diverse art scene of 20th-century Chicago to the enduring global fascination with Chinese ceramics. “Blue and White Ceramics: An Enduring Global Obsession” centers on Chinese blue and white porcelain, as well as ceramic-making traditions from around the world, including Dutch Delftware, Turkish Iznik tiles and mass-produced English transfer-printed ceramics, all of which took inspiration from Chinese wares. The objects on view range from Ming Dynasty porcelain to contemporary transferware and earthenware, highlighting more than six centuries of ceramicists’ responses to Chinese methods, decorative patterns and forms. The exhibition tells stories of global exchange, artistic emulation and shared aesthetics, and gives the public an opportunity to see some exceptionally beautiful objects from the KAM collection. Chinese porcelain is produced by firing a refined type of clay at high temperatures until it is vitreous, or glass-like. The result is a ceramic that is both strong and thin, to the point of being semitranslucent. It can withstand boiling water without cracking, making it ideal for preparing tea. 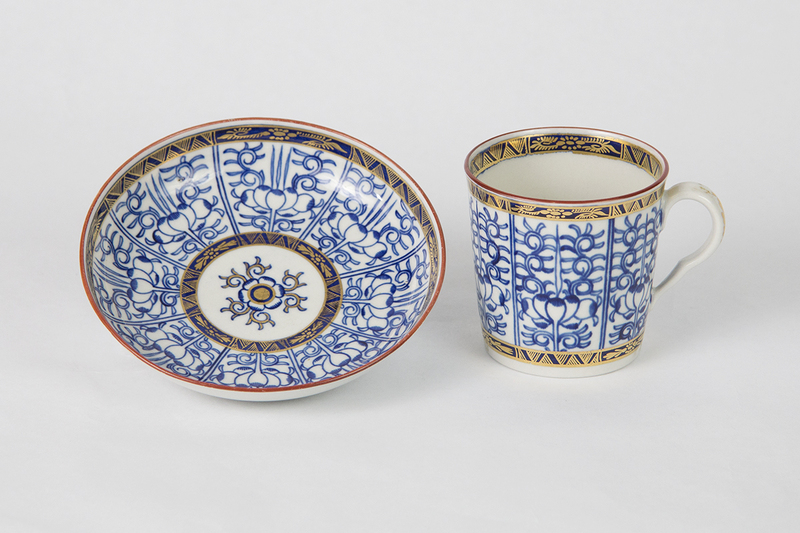 As tea became more affordable, it further increased the demand for porcelain in Europe. “Europeans had seen nothing like Chinese hard porcelain,” Warren said, adding there was a wide technological gap between the methods the Chinese used to produce porcelain and those the Europeans used to produce other types of ceramics. 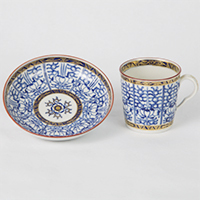 A Royal Lily pattern coffee cup and saucer is part of Krannert Art Museum’s blue and white ceramics collection. The cup and saucer were made in the late 18th century by Royal Worcester, one of the oldest companies producing porcelain in England. In the quest to create similar porcelain products, Europeans produced fine ceramicware that melded with their own artistic traditions, such as Delftware in the Netherlands, Warren said. 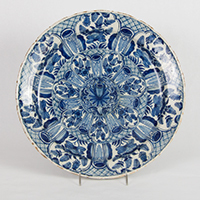 When the supply of Chinese porcelain declined in the late Ming Dynasty, Dutch potters in the early 17th century imitated Chinese patterns and forms to meet the ever-increasing demand for blue and white ceramics. Another successful tradition that owes much to Chinese porcelain is English transferware, which are mass-produced, decal-printed ceramics that were purchased by middle-class customers in Europe, the United States and Southeast Asia, Warren said. 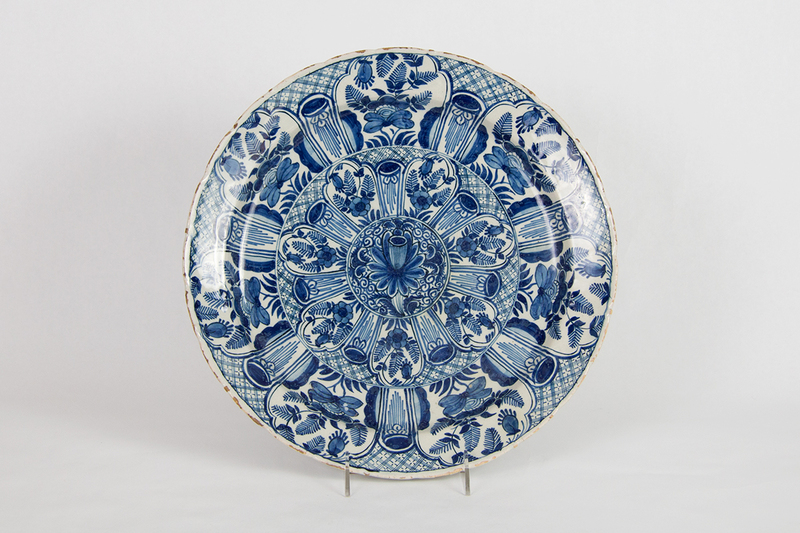 The exhibition features a range of transferware with images of exotic or imagined landscapes. Also on view are a variety of vessels for serving and storing coffee, tea and tobacco, which were imported luxuries for consumers in the 17th and 18th centuries. The exhibition also includes contemporary ceramics, such as the porcelain “mineral bottles” in the shape of disposable plastic water bottles by Huang Yan, which are transfer-printed with floral designs inspired by hand-painted wares of the Ming Dynasty. “Between the Buildings: Art From Chicago” looks at works from two groups of artists from the so-called Chicago School, while also considering the stories of other significant artists working in the city during that time. 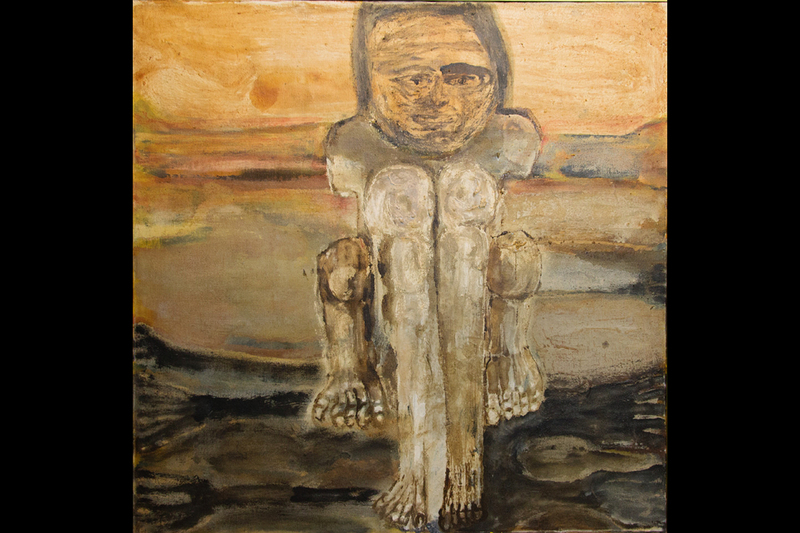 “The Sphinx,” a 1954 painting by Leon Golub, is an example of the work of the Monster Roster artists of Chicago. Their work often portrayed in muted colors images from classical mythology or ancient art. The Chicago School, comprised of the Monster Roster and the Imagists, was a narrative crafted by art critics who wanted to portray the figural work coming out of Chicago as being as important as New York abstract expressionism. The Monster Roster was made up of several artists in the 1950s who had served during World War II and subsequently attended art school on the GI Bill. Their expressive and psychological work often referred to classical mythology and ancient art, said Krannert Art Museum assistant curator Kathryn Koca Polite. The Imagists exhibited together at the Hyde Park Art Center in the late 1960s and early 1970s. Their highly personal works were greatly affected by images of popular culture. “They also shared incredible technical skill, specifically drawing – an attention to line,” Koca Polite said. Twentieth-century Chicago art also included a variety of artists, styles and subject matter that don’t fit neatly into either of the categories of the Chicago School, she said. “Between the Buildings” includes works engaging with U.S. history, including images dealing with issues of race, identity and the anti-war movement of the 1960s. A print by Charles White – highlighted in a retrospective that just closed at the Art Institute of Chicago – uses the style of pre-Civil War posters marketing slaves to question whether the unjust treatment of African-Americans has ended. 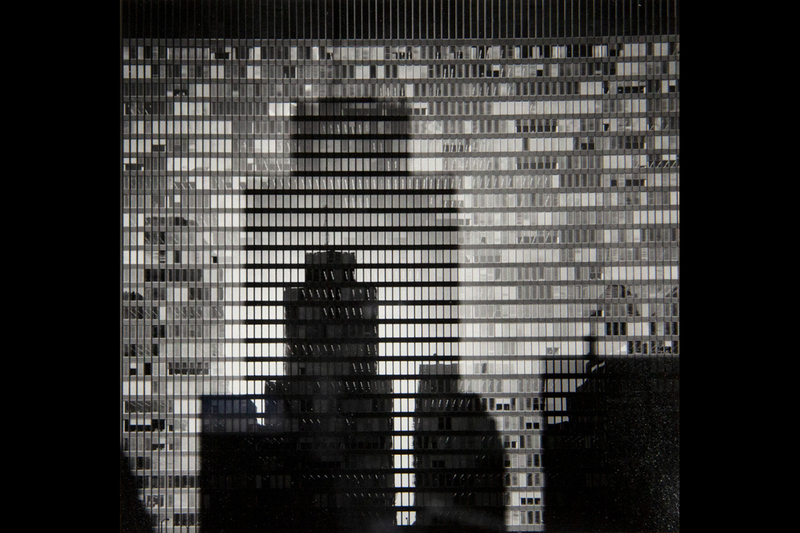 “Between the Buildings: Art From Chicago” features work by Chicago artists who were influenced by the city itself, such as “Federal Center, Chicago, IL,” a 1970 photograph by Bill Engdahl. 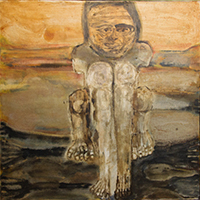 Several works deal with the figure in a more abstract sense. Among them is “Homage to Casper David Friedrich,” a large-scale abstract painting by Vera Klement. Friedrich was a 19th-century Romantic painter who portrayed figures in grand, expansive landscapes. Klement depicts a horizon line but no figure, suggesting the person viewing the painting is the figure in the landscape. Other works explore notions of fantasy and the absurd, influenced by European surrealism, while others are inspired by the urban fabric of Chicago. 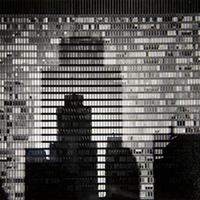 The latter includes “Street Scene II” by U. of I. alumnus Allen Stringfellow. 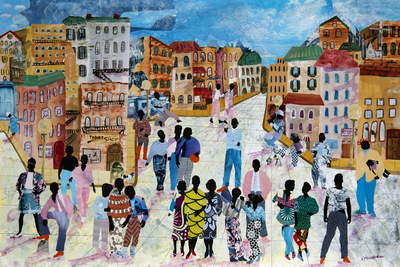 The collage and watercolor on paper presents a vibrant social event as residents, cut from paper and patterned textiles, gather amid the buildings of a Chicago neighborhood. Stringfellow plays with a sense of rhythm through the arrangements of color and pattern, evocative of the jazz music he listened to in his youth. “Between the Buildings” is on view at Krannert Art Museum through March 23 and “Blue and White Ceramics” through May 12. Editor’s note: More information about the exhibitions can be found online or by contacting Julia Nucci Kelly at jkell@illinois.edu.